Clone Ward Season 3 is approaching fast with the premier date of September 17th! I love it when a show gets the fans. 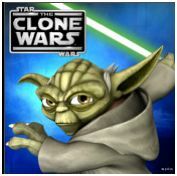 Star Wars: The Clone Wars, Season 3 is already available for a season pass . This is a nice change in pace from other shows/studios that have made us wait until the show has already started showing on TV or run it’s full season, I’m glowering at you HBO! In addition to that there is a Season 3 Sneak Peek for free! I got goose bumps watching it: An attack on the cloning facility, Ahsoka’s dreams, the Jedi Hunts begin and Cad Bane pulls a lightsaber! Star Wars Clone Wars is great family entertainment and a further exploration into the Clone War era of the Star Wars setting. I enjoyed season 1 with my only concern with the show being that it was a little kidsey and not so much family entertainment. George Lucas listened to us fans and in season 2 that changed and there were a lot more story rich and thoughtful episodes without alienating the younger audience. I can’t wait for season 3 to begin! Get your Season Pass here!